We are the sales and marketing office for Sun Run products which are ISO9001:2000 certified and tested according to ASME B 30.1 standard. 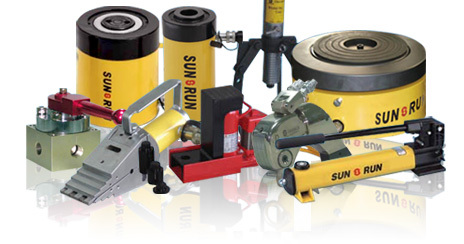 Our main scopes are distribution and supplies of complete range of hydraulic jacks and tools products. These includes various type of hydraulic cylinders up to 2000 ton, hydraulic pump (hand, electrical or air driven), hydraulic press, hydraulic bearing puller, hydraulic torque wrench, hydraulic bolt tensioner, toe lift jack and hydraulic tools. As a marketing oriented company, we are constantly seeking out industrys needs for new products through feedback from customers. © 2019. Copyright Sun Hydraulics Pte Ltd. All Rights Reserved. Hosted by Creative eWorld Pte Ltd.